​The Glossopteris tree is among many examples of vegetation and animal life that supports the concept of the crustal earth being of one land mass in the past, that it was catastrophically covered by water, and subsequently broken up. This supports the concepts seen in Genesis 1:9 "Then God said 'Let the waters below the heavens be gathered into one place, and let the dry land also appear', and it was so.'". And in Genesis 7:11 it says "In the six hundredth year of Noah's life, in the second month, on the same day all the fountains of the great deep burst open, and the floodgates of the sky were opened. "...vs19 "and the water prevailed more and more higher upon the earth, so that all the high mountains everywhere under the heavens were covered." (NASB). "Dicroidium is an extinct genus of fork-leaved seed ferns that were distributed over Gondwana during the Triassic (252 to 201 million years ago). Their fossils are known from South Africa,Australia, New Zealand, South America and Antarctica. They were first discovered in Triassic sediments of Tasmania by Morris in 1845." From Wikipedia. Antarctica has been described, during the designated Triassic Age, as having "... large tree stumps, identified as Jeffersonioxylon gordonese, surrounded by a forest litter entirely composed of Dicroidium...in situ..." (From: D. Cantrill and I. Poole The Vegetation of Antarctica Through Geologic Time, Cambridge Univ. Press 2012.) It should be noted that this fern can also be found in the designated Upper Permian and both the designated Laurasia and Gondwana regions. (See reference in chart below.) Thus it overlaps major geologic periods and the constructed time differentiated land masses.This is strong support for rapid, sequential, broad flood conditions consistent with the Noah Flood. Another animal group are the Mosasarus, fossil swimming reptiles, found on several continents in the northern and southern hemisphere. See below. ( figure of mosasaurus jaw from wikipedia with permit: "Mosasaurus hoffmannii holotype jaw fragments (great animal from Maastricht specimen, Muséum national d'histoire naturelle, Paris.2008. wikipedia with permit FunkMonk.)" They appear to represent similar groups of water bound life forms that were catastrophically buried throughout the earth during the covering of it with water. They are support for the earth being covered relatively simultaneously with water across vast pre-continental areas. There are "living fossils" alive today and found as fossil forms on different continents-such as the marine life form Nautilus. (Permit to use living nautalus photograph from Mark Spencer). This supports a relatively young age for the earth. It should be noted that there are fossil marine life forms found at great differences in elevation: in the Tithyes region of the Himalayias (17,000 feet above sea level, and ones found at the Dead Sea 1000 feet below sea level.) Dead Sea fossil pale brown, and the Tithyes region fossil dark colored natalus. This argues for massive uplifting and dropping of land that had probably been level with the water surrounding and covering it during the deposition of the strata. 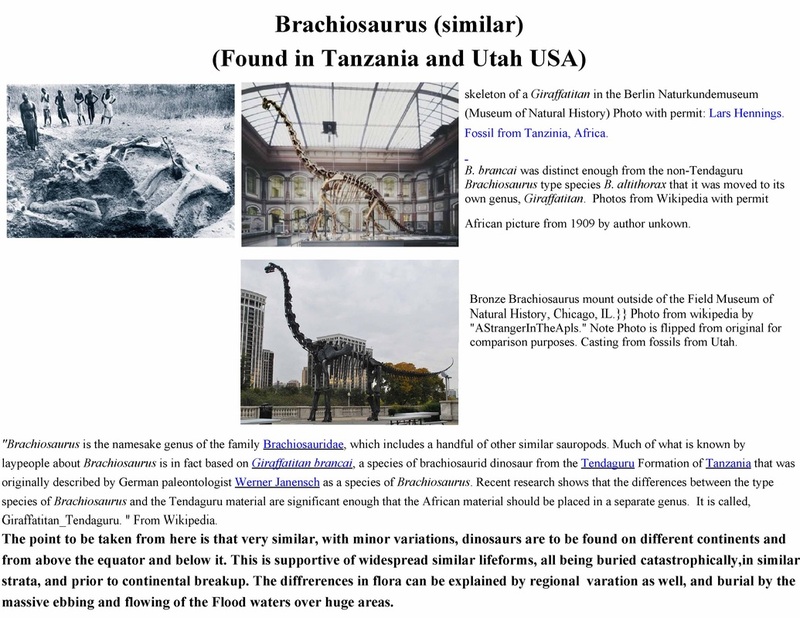 SEE FIGURES: Glossopteris slide show; Aetosaur worldwide distribution map; Mosasaurus worldwide distribution map; Trilobite carolinites and other species, Natalus living and fossil worldwide distribution map; Brachiosaurus worldwide distribution map; examples of fossil forms from the higher and lower strata of the earth. At the level of the Dead Sea fossil clam forms like that of the sand colored one on the left can be found at 1000 feet below ocean level. 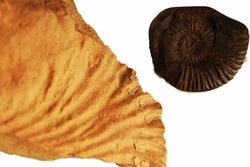 The nautilus on the right was found in the Tethys Region of the Himalayan Mountains at 17,000 feet above ocean level. Water born life forms that have been fossilized are found across the crustal earth and throughout the depths of its strata. This is strongly supportive of massive watery muddy flooding conditions having occurred in the past over the entire earth. "'I have some samples here in my office where you can still see tiny fragments of coral and conodonts which were once swimming around in an ocean somewhere near the equator,' explains Dr Mike Searle, Research Fellow at Oxford's Department of Earth Sciences. These marine sediments lie atop sedimentary and igneous rocks which have been baked by high temperatures and pressures into crystalline metamorphic rocks." From: BBC News 2013 Everest Rock Map Published. In other publications the peak rock strata is designate Ordovician. Picture is from Wikimedia with permit done by Carsten.Nebel. Thus Mount Everest, the highest land point on earth, at 29,000 feet above sea level, has marine fossils at its very top. This is consistent with massive watery deposition and subsequent uplifting as "The Indian plate is moving northwards and piling into the Asian plate, in the process pushing rocks deep down into the crust. This subduction is in turn forcing the rocks above upwards - including those around Everest." per the BBC report. 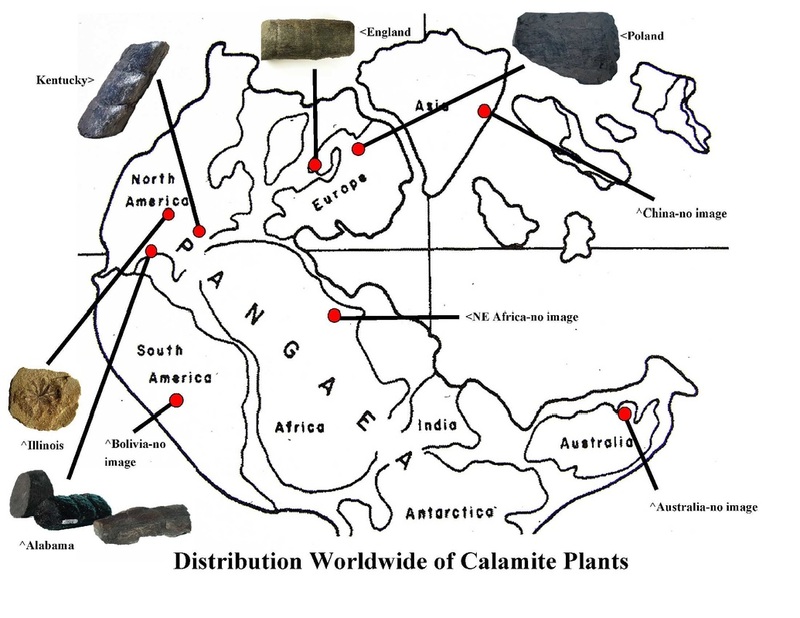 See Dr Baumgardner's studies on plate tectonics linked on this website. 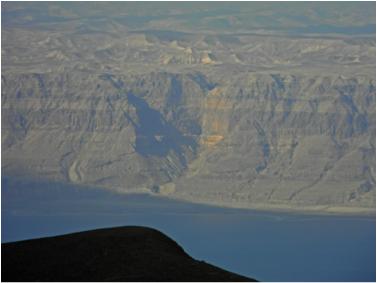 Dead Sea Level: 1000 feet below ocean level, note stratified rock layers on other side-Judea. Photo from air towards Jerusalem and foothills. Anatomical description: “extinct, pelagic bivalve arthropod; the various species may have been free-swimming predators…pair of large spherical eyes…two large appendages…possibly 14 flippered swimming legs (setose exopods) and steer with a flap-like tail (or telson). There are many variations, and in some areas thousands of fossil forms have been found. 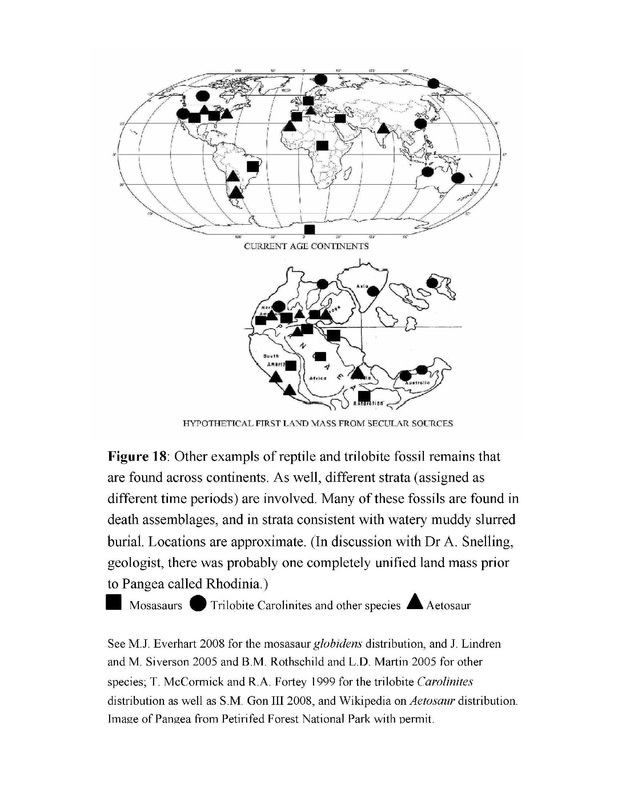 Found as a fossil across continents (examples): Greenland I. volucris, China I. auritus, Canadian Rocky Mts. I.acutangulus. General article from Wikipedia on Isoyxs. Vannier, J. et al (2009) “Arthropod visual predators in the early pelagic ecosystem…” Proceeding Biological sciences/Royal Society 276(1667):2567-2574. Caron, J. (2006) “Taphonomy of the Greater Phyllopod Bed community, Burgess Shale.” PALAIOS 21(5): 451-65. Gabott, S. E.; Zalasiewicz, J.; Collins, D. (2008). "Sedimentation of the Phyllopod Bed within the Cambrian Burgess Shale Formation of British Columbia". 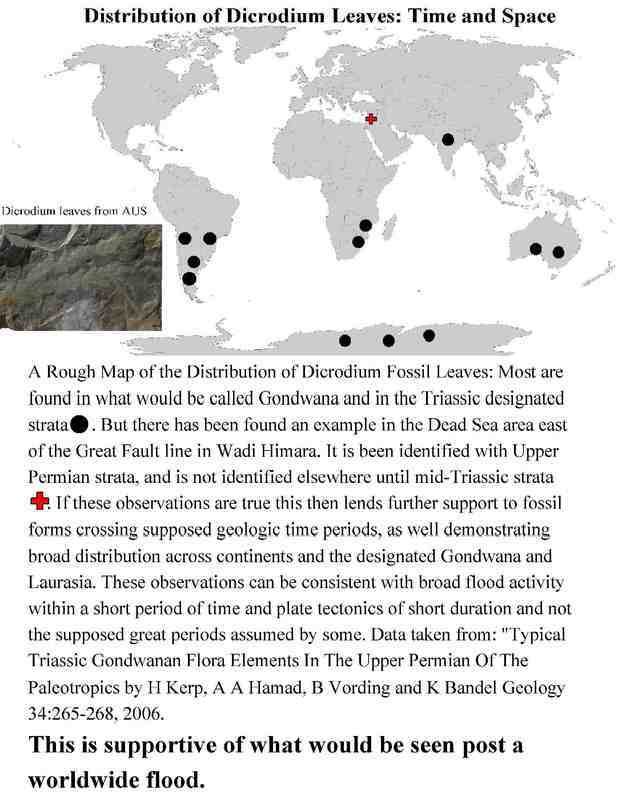 Journal of the Geological Society 165: 307. Stein, M. (2009) “Isoyxs (Arthropoda) with preserved soft anatomy…” Lethaia 43(2):258.